China launched a new memberof its budding satellite navigation system Tuesday, the first of up to 10 suchspacecraft scheduled to be added by the end of next year. The Compass G2 satelliteblasted off at 1616 GMT (12:16 p.m. EDT) from the Xichang launch base insouthwestern China's Sichuan province, the state-run Xinhua news agencyreported. A Long March 3C boosterdeployed the navigation satellite into a geostationary transfer orbit with ahigh point of about 22,250 miles, a low point of about 125 miles and aninclination of 20.5 degrees, according to tracking data. Compass G2 will soon useits own propulsion system to reach a circular orbit along the equator at analtitude of about 22,300 miles. 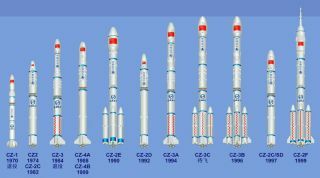 The new spacecraft is the secondsatellite of China's second-generationnavigation fleet, which will eventually include more than 30 satellitesparked in geostationary and medium-altitude orbits, according to Xinhua. China launched the firstCompass satellite bound for a medium-altitude orbit two years ago. Compass G2is the first geostationary satellite of the group. The fleet will beam preciseposition, altitude and time information to users on the ground. Up to 10 more Compasssatellites could be launched by the end of next year, according to Xinhua. Officials predict theCompass system will be completed by 2015 to provide global navigation coverage,supplanting the U.S. Global Positioning System in Chinese cars, cell phones andother commercial applications. Other applications for thesystem include transportation, meteorology, petroleum prospecting, forest firemonitoring, disaster response, telecommunications and public security,according to Xinhua. The first-generation Beidouconstellation provides only regional coverage over China, according toXinhua. Tuesday's flight wasChina's first space launch of 2009 and the 18th launch worldwide to reach orbitthis year.